Brush both sides of the chicken breasts with olive oil and season with salt and pepper. Grill or pan-sear the chicken 6 to 9 minutes per side, or until juices run clear when poked with a fork. Top each chicken breast with a slice of cheese and continue to warm the chicken over very low heat for 1 to 2 additional minutes, or until the cheese is melted. Lightly grill or toast the buns. Brush one side of each Kumato® brand Tomatoes slices with a thick layer of the pesto, reserving some of the pesto for the mayonnaise. Lay the pesto-coated side of the tomatoes up on the grill, and off direct heat. Grill 2 to 3 minutes, or until tomatoes have softened and absorbed some of the pesto. Sprinkle each slice with Parmesan if desired. 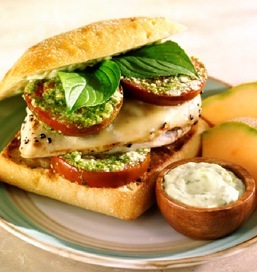 To assemble sandwich, place bottom bun on a plate and lay 2 pesto tomato slices over, lay down the chicken, then place 2 more tomato slices on the chicken, and finish with 2 basil leaves if desired. Mix mayonnaise with remaining pesto, and spices to taste, and spread a thin layer over the top of each bun. Serve additional mayonnaise on the side with each sandwich. Serve hot. Tips and Serving Suggestions. Several varieties of cheese would taste great with this delightful chicken sandwich, your choice! After grilling the buns, spread both the top and bottom bun with a layer of whipped goat cheese. Arugula, lettuce, or fresh spinach leaves can be substituted for the basil leaves. A simple, toasted hamburger bun will work nicely, if ciabatta or focaccia bread varieties are not available.